Millions Of Sharks Are Finned And Left To Drown To Make Sharks Fin Soup For Wedding Banquets. IS THAT HOW WE SHOULD CELEBRATE A HAPPY OCCASION? To discourage Chinese newlyweds from serving sharks fin soup at their wedding banquets, we created a Chinese paper cutting with a twist. Unlike traditional wedding paper cuttings that consist of auspicious symbols of joy, union and abundance, ours depict the cruel and wasteful practice of shark finning. The intricate paper cutting details the grim and bloody practice of finning, where fishermen hack the fins off sharks and then throw them overboard to drown – all this just to fuel the demand for sharks fin soup. 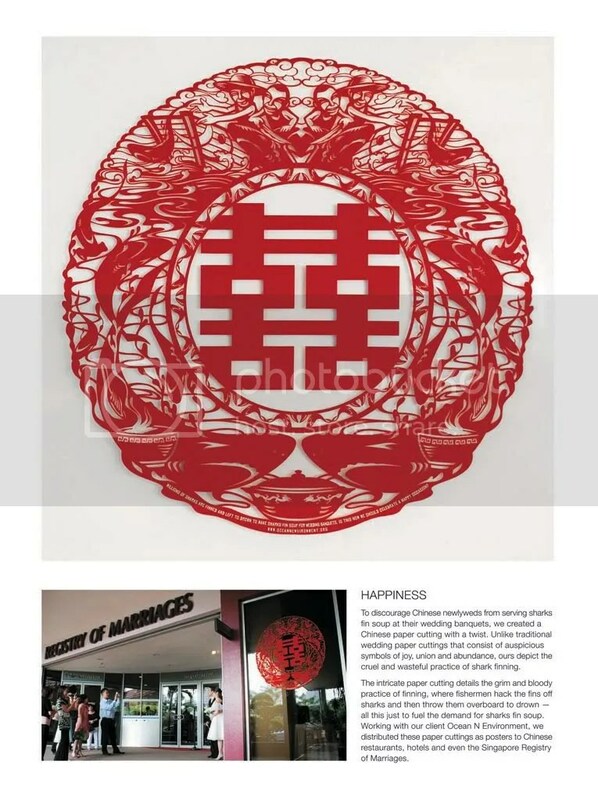 Working with our client Ocean N Environment, we distributed these paper cuttings as posters to Chinese restaurants, hotels and even the Singapore Registry of Marriages. One of my work while i was in Advertising. Art by me. Copy by Charlene Chua.